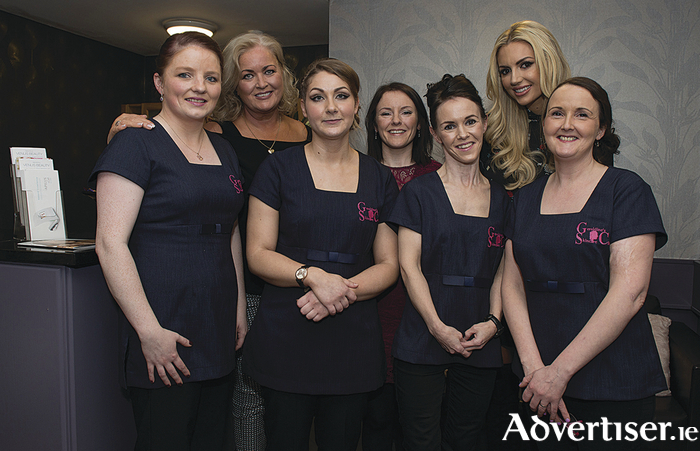 Geraldines Skincare consultants Zita, Olwyn, Geraldine, and Breege at a recent launch with Rosanna Davison and Sallyanne Clarke. Photo: Michael McLaughlin. The first step towards better skin starts with VISIA complexion analysis and now this can be attained at Geraldine's Skincare Clinic, Westport. The latest in a long line of innovative and revolutionary skincare therapies to be launched at the salon, the VISIA Skin Scan is a multi-spectral imaging process that reveals damage and signs of ageing on and beneath the surface of the skin that is not visible to the human eye. The first salon in Mayo to offer this exceptional treatment, Geraldine Greenan and her team of experts will now be able to provide the most comprehensive skin and complexion analysis Ireland has to offer with VISIA technology. The practitioners of Geraldine's Skincare Clinic will use this new technology to evaluate the health and appearance of the client's skin based on the six criteria that affect the complexion: wrinkles, spots, pores, evenness (skin tone colour variation ), porphyrins (evidence of bacteria in your pores ), and UV spots caused by overexposure to the sun. This kind of information is invaluable as it allows the salon's expert therapists to provide the most accurate advice to clients for the most effective skin results. This will offer clients the opportunity to detect – and tackle – some of the aesthetic skin ageing symptoms before they become apparent. Celebrating the salon's 15th year in the industry Geraldine's Skincare Clinic strives always to offer its clients the most innovative treatments and technologies available on the market. This technology will perfectly complement the current line of high-end therapies to provide every client the results they desire. Current therapies available at the salon include Venus Freeze, CACI, Environ, Margaret Dabbs, Dermalogica, Lycon and Jane Ireldale. Contact the salon with enquiries at [email protected] or through their Facebook page or by phone on (098 ) 50990.